Where to buy my “Any Yarn, Any Size, Knit Hat Book”, “Kids Knit!”, baby doll cradle purse and llama watch cap knitting patterns. Watch this space for more publications by me. Have you ever picked up a skein of yarn to knit a hat and then been frustrated that you couldn’t find a pattern for your yarn in a style that you like? 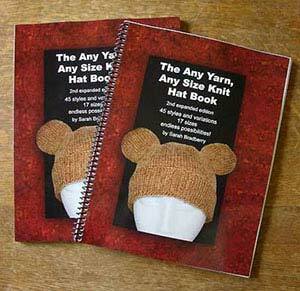 With “The Any Yarn, Any Size Knit Hat Book” you can knit hats in any of 45 styles and variations with any yarn you like. Each pattern can be knit in 17 sizes from 8″ circumference for premature babies all the way up to 24″! Click here to find out more about The Any Yarn, Any Size, Knit Hat Book. “The Any Yarn, Any Size Knit Hat Book” contains 144 pages of patterns and techniques, illustrated throughout with large black and white photographs of each hat with colour photos available online in the photo gallery. The book is available in three formats from Lulu.com. Click the version you would like to visit my Lulu book store. If you would like to purchase copies for resale please contact me for details. Teach your children to knit, or learn yourself, with my very first published book. Still selling strong after over 8 years in print! Click the appropriate link below each pattern description for your choice of product/shop. 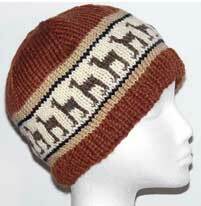 A thick worsted knit beanie with a band of parading llamas knit in a simple fair-isle design. One size to fit 20 – 22.5 inches. Pattern includes all instructions and llama chart. in pdf format from Ravelry. A reworking of an old crochet favourite. This simple to knit lined purse turns into a cradle in seconds just by turning the top of the purse over! Pattern includes instructions for purse, sleeping bag and baby doll knit in worsted weight yarns and contains large photographs of each piece.